This season I’ve been loving quite a variety of shoe, I mean, there’s even trainers and if you know me, you know that I’ve always been somewhat ‘scared’ to wear trainers, however the past year or so I’ve really been getting into it, and I’ve been religiously wearing a pair that I love! There’s also some colour in there, some metallic and a statement boot, because footwear deserve to be the standout of any outfit. First up we’ve got these 60’s inspired metallic beauties! I mean, we all know how I feel about styling myself as though I’m fresh from the 60’s, as well as how much I’ve mean adoring anything metallic silver over the past few months. So these shoes are the perfect combination of the two AND they’re actually comfortable – It’s a match made in heaven! These shoes just add a really retro yet modern feel to an everyday outfit, or if you’re trying to slightly dress down an evening look. They remind me of something Alexa Chung would wear with a skirt and an oversized blazer. They’re basically the easiest thing to style ever. The fact that they’re silver means that they go with EVERYTHING. I’ve been wearing them with high waisted cigarette trousers to just add a girl touch to a masculine staple. Or with fishnet tights and an a-line mini skirt to complete a classic 60’s look. These vibrant classic are the most recent addition to my shoe-drobe. I’ve been absolutely loving red recently. 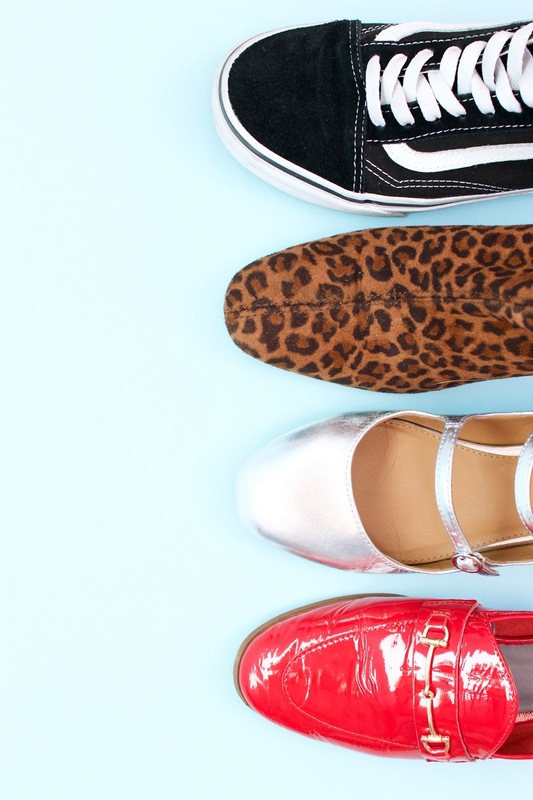 Ever since I was gifted my beloved red Kate Spade Doddy bag in December for my birthday, I’ve had red loafers on my radar, however I’ve found it SO hard to find a pair that I really liked. I found the perfect ones in Toyshop, they’re patent faux leather, however they’re so soft. Although I’m still in the stages of breaking them in, I know full well that once they’re broken in, these beauties are going to be so comfortable! Despite them being amazing Gucci dupes, they’ve added a whole new vibe to my wardrobe, they’ve basically just been spicing up my casual outfits and making them that little bit more interesting. I’ve had these boots for a few months now, however, I’ve been a little scared to wear them during the Winter months. Simply because I love them so much and don’t want the unreliable, miserable Winter weather to ruin them. I mean, it’s not like we have the best weather in Spring in the UK either, however, it’s time to put these bad boys into use! If you don’t have a very colourful wardrobe, or you’re just not into wearing too much colour, but want to begin injecting something different into your wardrobe, I think leopard print boots are the perfect place to start. They just add something different to an outfit, even if you’re wearing all black it just breaks the look up a little bit. I’ve been losing wearing them with band t-shirts and some vintage wash cropped leg denim jeans. You know when an outfit just looks so effortless and you feel cool AF, yeah? Well, that’s how I feel when I wear that outfit. Invincible. If you’ve been reading my blog for a while now, you’ll know that until about a year ago I was a self confessed trainer-phobe, as in I was so unsure how to style trainers and whether or not they actually suited me. However, since then I’ve really been making an effort to get into trainers and style them in a way that suits me. I bought these shoes a few months ago and they pretty much haven’t left my feet since. Simply because they’re so comfortable and they don’t look super sporty. Don’t get me wrong I really wish I could pull off the whole ‘chic/sports luxe’ style however I just don’t. It doesn’t suit me and it’s doesn’t fit in with my personal style what-so-ever. The old skool vans style actually works with my personal style and I’ve really been enjoying styling them over the past few months. I’ve completely lusting over the mustard yellow/white colour way, I think they’ll be perfect for Summer, so I think a cheeky little purchase will be happening very soon! I’m so excited for Spring, which is strange considering I’m a huge Autumn/Winter lover. I’ve really been enjoying changing up my wardrobe, so stay tuned for some more Spring inspired style posts coming very soon!